In the end, the little lion usually inclines the scales in positive. The lion is not at all interested in observing justice and balance: he is oriented toward extremes. He is capable of pulling Libra to his side. The scales find the love of the Lion refreshing, they are warmed by the attachment and enthusiasm of the Lion, but sometimes the heat that the king of beasts emits becomes unbearable for Libra. Weights need to step back and rest. 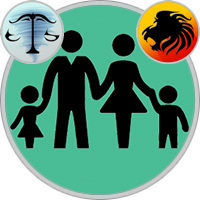 Libra parents often try to present a perspective to Leo, offer explanations, arguments and alternatives, since Leo always considers any question from his own point of view. He just does not know how to look at him from a different angle. But Libra is endowed with this ability from birth and to such an extent that sometimes come to confusion, faced with many opportunities. Therefore, Libra’s judiciousness and the spontaneity of the Lion are a successful combination - of course, if they act together, rather than engage in confrontation. However, Libra usually likes to cooperate, not to contradict. Sociable Libra mom can create a suitable environment for his friendly child. She has a lot of friends, and this is a very fertile audience for a little Leo, who needs the public so much. The lion likes to show himself in society, and since the mother very often takes it with him, he will gladly catch the admiring glances of others. And the little Leo really likes everyone. It seems that he is so bright that his desire to constantly attract everyone’s attention does not cause anybody to protest. Libra mother knows how to make Lion feels that he is the best child in the world. She praises him for any manifestation of kindness, and he does not just accept it - he wants it to correspond. Mother feels that the child responds to her love with love, and tries to be sensitive and soft. Yes, these two really adore each other! The noisy Lion is rarely out of sorts, but when this happens to him, the mother will comfort him easily. Scales are more dependent on the mood, but Leo will help Mom-Libra deal with this at the first hint of anguish. He himself believes that one should live in one’s own pleasure, not wasting time for nothing, and his energy and constructive approach will greatly help the doubting Libra. These two people like to share ideas and dreams and are at the same time full of optimism. The mother will be able to give her child the freedom necessary for self-expression, for creativity and fun, but will not forget to teach him common sense. Yes, they really are a wonderful combination! Dad-Libra wants to be proud of her child, because what he demonstrates to all must be on the level! He manages to create the image of the head of an excellent family, in which even children behave impeccably, and in the person of Leo he really gets a child who everyone will admire. Little Leo is so sociable, so charming, although he can make a blunder when it comes to good manners, because he interferes in any conversation or speaks out of place and he has, to put it mildly, an eccentric taste. But all this is trifles, but mostly it is quite worthy of the father’s praise. Leo will react very painfully to his father’s criticism, but he will try to make up for everything using any improvised means. But it is much better to influence him with praise. It will not do him any harm, even if he starts to imagine too much about himself. Besides, he has enough politeness not to hurt others. Libra encourages Leo to independence and teaches him to act with full responsibility. This child is born a good organizer, and the sooner he gets the opportunity to show these abilities, the better. Probably, it makes sense to give him a kitten, so that he cared for him, fed him and at the same time felt strong. Libra will also be able to open the world of culture to its child, to awaken in him a love for beauty, and Leo will remember these lessons throughout his life. Leo, more ardent than Libra, happily rushes into disputes, while his father tries to judge everything from the standpoint of logic. If Leo is not confident in himself, he begins to get angry, because he is not used to losing. Well, if this happens, the father will have to restore the lost balance. But this he does very skillfully. As for family problems, it’s probably not worthwhile hiding them from a Leo child. He may be more adult than he seems, and prefers to know what is going on around him. Most of the time Leo will entertain and please the father: in this child there is so much activity and determination, energy and warmth! Well, Leo is proud of how his father knows how to understand people. And besides, he just has an impeccable taste!